Well who would have thought I would go from a life of service to a life of zombie apocalypse reporting? Not me! That is until Robert read me Woody and June versus the Wannabe Warlord. He told me it was a zombie adventure/love story. I am the first audience for every short story, novelette and novel Robert writes. Picture this: me making dinner, chopping various veggies in the kitchen; Robert sitting on the floor in the hallway reading aloud to me. While he reads, I listen, make comments, give feedback. He often will pause while reading and say, “ok, wait a sec” while he wildly makes corrections to his odd grammar choices, or looks for words that better fit the tale. I am not a fan of zombie stuff; vampires yes, zombies, no. I am worried enough that we are already living in an apocalyptic time given the blaringly impossible news headlines about greedy politicians, nukes, fatal epidemics, and climate disasters. I am a very visual person, so I have nightmares if I’m exposed to gore and violence, especially the brain-eating stuff zombies are known for. Last, but not least, did I say this already? I am not a fan of zombie stuff! I am, however, a very loyal fan of various artists, songs, movies and writers. I tend to gush and celebrate the likes of Led Zeppelin, Pink Floyd, Ghost Busters, Meryl Streep, Tom Robbins, Stephen Colbert and others. Since Robert knows me so well, he often remarks that I am “such a fan.” Hearing him read the first couple paragraphs, I was hooked; an instant FAN! So, it makes sense that I become the founding member and reporting voice for the Woody and June Fan Club. The story is immediately light-hearted and fun. There is a hint of problematic zombies, lots of detail about our home city, Flagstaff, and an introduction to two characters that are going headlong into an adventure. Woody is humorous, easily distracted, and innovative. To fend off zombies, his weapon of choice is a baseball bat. June is tough, guarded, and super independent. Her weapon(s) of choice. . . guns. They make an interesting pair right off the bat (no pun intended). According to Wikipedia, the term “fan” has roots from the 1800’s when boxing enthusiasts took a “fancy” to the sport. For modern sports fans, it’s a short version of the word “fanatic.” I prefer the “taking a fancy” approach. I truly fancy Woody and June, and I think you will too. It’s a breath of fresh air, despite the stinky zombie characters. If you are already a member of the Fan Club, welcome! If you are not, you are now cordially invited to join! I’ll be offering regular reports about how the apocalypse is going and how Woody and June are doing. 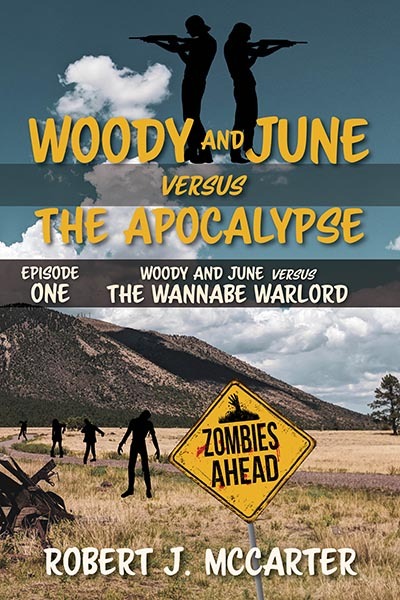 Fan Club members will receive FOR FREE (and before release to the general public), the first episode, Woody and June versus the Wannabe Warlord. You’ll get free stuff, like a collaboratively designed (by me and Robert) Woody & June Zombie Valentine, digital wall paper and digital Zombie Arizona post cards. You’ll also get a behind-the-scenes view of all things Woody and June. Let the fun begin!